We are enjoying the scenery the wilderness with the river view in the bathroom. The print on it is very clear. It’s like you are right there at the river or bay with your canoe and backpack and paddles. Very satisfied with this shower curtain. Update your bathroom with this stylish blue shower curtain. Bring the serenity of nature into your bathroom with Laural Home's 'Blue Lake Shower Curtain'. This photorealistic curtain is the perfect addition to any rustic decor. 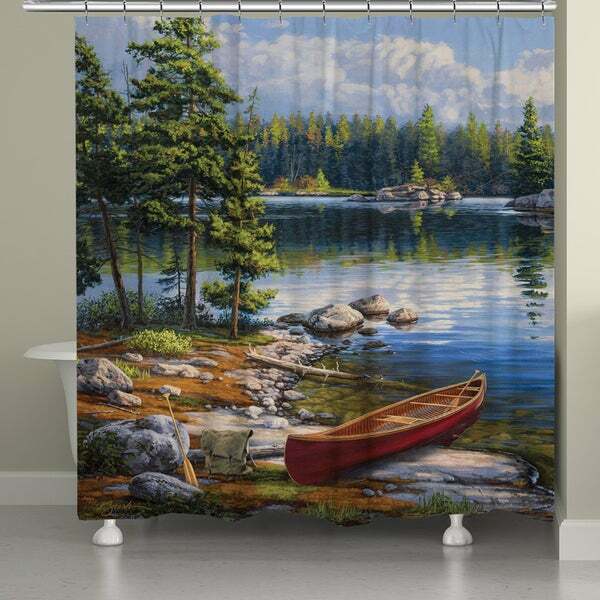 This shower curtain is printed to create crisp, vibrant colors and images. 12 button holes at the top for shower hook placement. Polyester Fabric Tuscan City Street Shower Curtain with Hooks 70"x70"